Take a good look at the background I use on this site. Imagine if you would that the pattern also contained very light aquas and pinks. So subtle you would hardly notice it. That would be a close approximation of the pattern and colors found in the last wallpaper to be hung in the living room. I was amazed to find remnants of this wallpaper still on the wall inside the living room closet. The layers of wallpaper that covered the fully plastered lath walls in the house were totally stripped off in the '50s. There must have been at least four or five layers taken off very carefully. 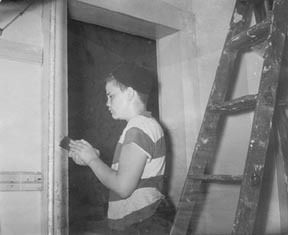 First a large wettened brush was used to soak the wallpaper. Then, using putty knives, the layers were carefully removed a little at a time, all the while rewetting as necessary. We all took part in the project. Dad impressed on us that It was very important to conserve the plaster surface in an unscared condition, to allow for painting with as little restoration as possible. In other words, "Don't gouge the plaster!" For the most part we managed to complete the work as requested. I personally liked the looks of the house better with the wallpaper.